Onomichi is located about 600km west of Tokyo, in the eastern part of Hiroshima Prefecture. This harbor city faces Japan's Inland Sea and its population is about 150,000. The city historically prospered as a pivotal town in the feudal transportation route on the Seto Inland Sea. In more recent times, it has become the gateway to the island of Shikoku after the opening of the Shimanami Sea Route. This slender coastal town is about 20km from east to west and about 35km from north to south. Onomichi can be divided into 3 areas: the "Central Area" which is filled with many major tourist spots, the "Mountain Area" which is noted for its beautiful countryside scenery, and the "Ocean Area" which boasts an incredible view of the islands beside the Shimanami Sea Rout in the Seto Inland Sea. and offers many spaces for relaxation. 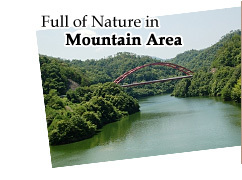 Enjoy outdoor sports and taking a forest bath. The scenery that you imagine when you hear the name "Onomichi" will spread out before your eyes. If you look up at the hillside, you will see private houses and temples standing together upon narrow slopes with stairs winding among them. Since Onomichi did not encounter any war damage, the stores and houses in town retain the lovely atmosphere and taste from the "Showa" era. 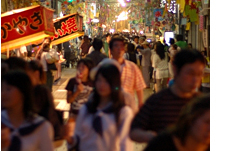 For this reason, Onomichi is referred to as "Little Kyoto". The Shimanami Sea Route and sceneries of islands in the Ocean Area. This Shimanami Sea Route is a well known cycling route. A lot of cyclists visit from throughout the country. Cultivation of fruits is prosperous. Onomichi is the birthplace of domestic lemons and hassaku (a thick-skinned grapefruit-like fruit). Recommended clothing: December to the beginning of March : warm jacket or coat. Middle of March to June, October and November : light jacket or sweater. 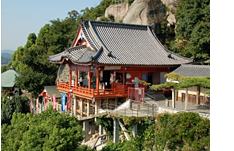 25 temples are based in the Central Area of Onomichi. You can visit "all of these temples on foot " since they are located in walking distance. There are a wide display of temples and shrines including Designated National Treasures. You may also experience "Nigiri Botoke" (squeezing Buddha) and Zazen (sitting in silent Zen meditation). You can also enjoy many flowers in all four seasons: cherry blossoms, Japanese tree peony or hydrangea. Collect all red seals at each temple through "7-Temple Tour" and pray for the completion of a vow. There are many attractive temples in Innoshima and Setoda. Onomichi is also known as The Town of Movies since many movies are filmed here. One of the most popular award-winning movies that was filmed here is "Tokyo Story" which was directed by Ozu Yasujiro and was selected by BBC as one of the 100 most acclaimed movies of the 21st century. 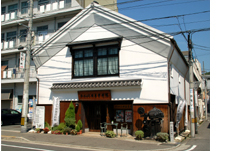 You can find information about "Tokyo Story" at "Onomichi Movie Museum". The scenic town of Onomichi has been loved since olden days by many famous poets and great writers, and has appeared in a lot of works. 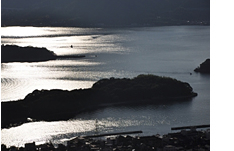 Two famous authors, Hayashi Fumiko ("Vagabond's Song") and Shiga Naoya ("A Dark Night's Passing") both hail from Onomichi. 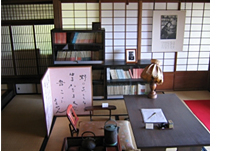 You can learn about their works at "Path of Literature" in Senkoji Temple & Park or at "Onomichi Literature Museum." Haiku is also very popular in Onomichi. When you create a beautiful Haiku poem, please post it in a "Box for Haiku" at every step in town. You can enjoy Haiku at "Onomichi Haiku Festival" that is held under the cherry blossoms blooming throughout Senkoji Temple & Park in spring. There are 6 museums in Onomichi including "Ikuo Hirayama Museum of Art" that represents the works of painter Hirayama Ikuo, and "Entsuba Memorial Park" that represents the sculptures of renewed master Entsuba Katsuzo. Since each museum has its unique exhibition, making a deliberate visit to all the museums is recommended. 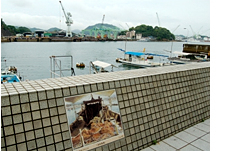 The painting contest "Town of Art, Onomichi, Four Seasons" is held every other year. Why don't you draw the four seasons of Onomichi on canvas? Onomichi is a lovely picturesque town of old and narrow paths, stairs, temples and so on. Magnificent views of islands weave in front of you when you visit Shimanami Sea Route. This town is an excellent place for photography lovers since many photographic subjects abound during the four seasons. Why don't you submit your best photograph for the "Town of Art, Onomichi, and Four Seasons" contest that is held every other year? 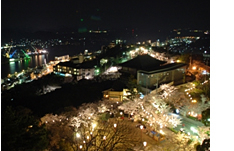 Onomichi is a town where numerous festivals are held throughout the year. Between spring and autumn is especially an ideal time to experience special events and festivals in Onomichi. The "Minato Festival", "Onomichi Sumiyoshi Fireworks Festival", "Innoshima Suigun Festival" and "Onomichi Betcha Festival" will surely impress you. Why don't you join one of these festivals yourself! 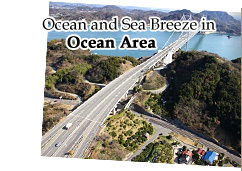 The "Shimanami Sea Route" which connects seven islands along the way from Onomichi to Imabari City in Ehime Prefecture is a renowned attraction and also offers one of the best cycling roads in Japan. Each island has a terminal for bicycle rental service. You may challenge to ride the length of the Shimanami Sea Route or you can enjoy visiting each island to feel the breeze. Various courses are available according to your time and condition. 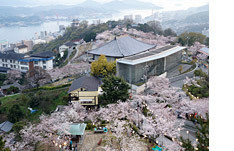 Cherry blossoms represent Onomichi as the city flower and tree. "Senkoji Temple & Park" has spectacular cherry blossoms and has been chosen as one of the "Top 100 Sites of Beautiful Cherry Blossoms" in Japan. In the season of cherry blossoms, many people come and see them at Saikokuji Temple and Kosanji Temple in Setoda. "Onomichi Eau de Parfum" which is an original and limited product of Onomichi makes for a fine souvenir since it is made from the cherry blossoms within in Senkoji Temple & Park. In 2009, "Senkoji Temple & Park" became the official symbol of Onomichi and is recognized as "Lover's Sanctuary" ("a Holy Site for Lovers"). Make an unforgettable memory at Senkoji Temple & Park on your anniversary day. The Observatory that has been selected as a "Top 100 Night View" will be the best place to declare your feeling of love or your appreciation to your lover while gazing at the night view.